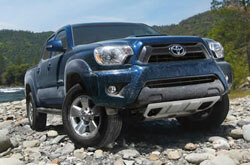 Make the most out of your next Tacoma purchase by reading a review of the 2013 Toyota Tacoma before you buy. With the help of automotive writers, Kenny Kent Toyota put together some of the most outstandingToyota Tacoma reviews you'll find anywhere. Filled with important material and specs, each paragraph gives you full access to everything the Toyota Tacoma has to offer. We wish you the best of luck in your search for the perfect Toyota! What are you waiting for? Find your Tacoma now! When comparing the 2013 Toyota Tacoma next to the 2013 Honda Ridgeline, Dodge Dakota, Chevrolet Colorado, Ford Ranger and the Nissan Frontier, and you'll find that the Tacoma outperforms those autos in quite a few aspects. View just a few of the reasons below. Don't look to a independent car repair shop in Evansville when Kenny Kent Toyota's exceptional Tacoma experts are only a quick trek away from your neighborhood. We also throw in a 12-month long warranty on our work - more than most independent shops do. When you bring your Tacoma to our auto repair unit in Evansville, you'll get quality service from our well-versed mechanics. The following is barely a portion of what we handle: front and rear brake pad checkups, engine repairs, fuel filter replacement and much more. We also tackle a multitude of other services. Beyond this you can anticipate getting economical prices on all work, as well as superior service every time you stopover at Kenny Kent Toyota. Check out our service specials by clicking on the link below.